This Bodyguard has a stonewashed finished blade with a plain cutting edge. 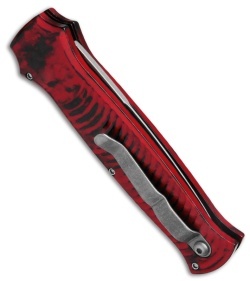 The handle is red marble anodized aluminum with a bead blasted pocket clip and hardware. 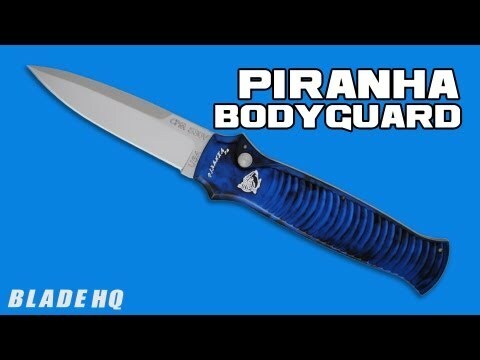 The Piranha Bodyguard is a contemporary spin on the classic stiletto style. 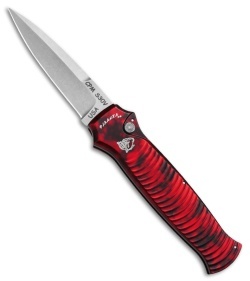 These automatic knives fire hard and fast with the push of the button. The Bodyguard has an anodized 6061-T6 aluminum handle with the firing button on front and a titanium clip on back for tip-up carry. The blade is premium CPM-S30V stainless steel. I got the serrated version, simply because I find serrated knives to useful in a greater variety of situations. However, based on the quality of the copy I got, I have also ordered a plain plum color stonewash version. The knife I got is surprisingly light, and rock solid both in terms of vertical as of horizontal movement. The steel of course is of highest quality, and the knife is very beautiful in my opinion, though I understand beauty as a rule is truly in the eyes of the beholder. But on more objective grounds again, this knife is long enough for people with largish hands like myself, for whom the likes of the X or the Pocket can become uncomfortably small, and the titanium clip is very well designed also rock solid. Finally the price one pays for a knife of this quality simply can't be beat. Most highly recommended.